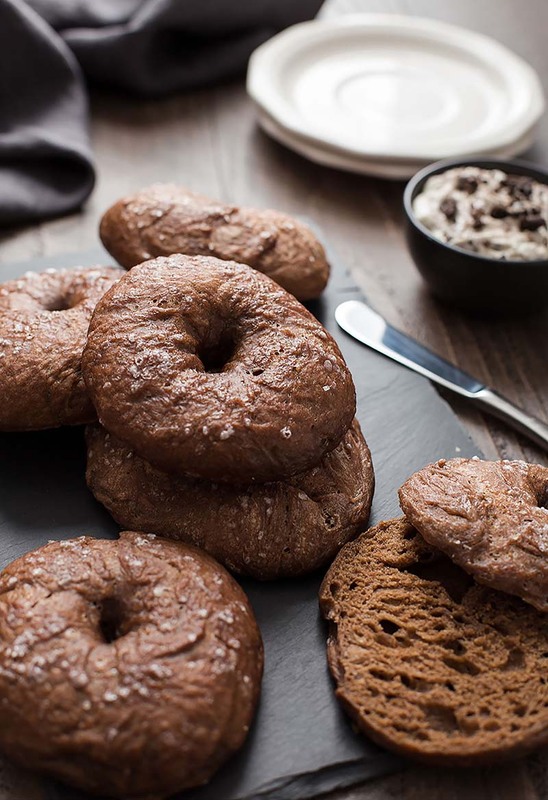 Crisp-on-the-outside, chewy-on-the-inside chocolate bagels topped with a slightly sweet cookies and cream whipped cream cheese. In a stand mixer attached with the dough hook attachment, add flour, cocoa powder and salt. Mix on low speed until combined. Transfer the dough to a lightly floured surface. Knead the dough, adding flour as needed, for an additional 1 minute. Shape the dough into a smooth ball and place the dough in a lightly oiled bowl. Cover with a clean, dry dish towel and place the bowl in a warm, undisturbed area of your kitchen. Allow the dough to rise until its double in size, about 1-2 hours. While the dough is resting, heat 8 cups of water to a gentle boil and preheat the oven to 400°F. Line a baking sheet with parchment paper. Boil the bagels for 40 seconds on each side. Remove bagels from the water with a slotted spoon and transfer onto your prepared baking sheet. Sprinkle each bagel with a generous pinch of coarse sugar and bake for 25-30 minutes, or until the tops of the bagels are golden brown. Bread flour will yield the best results, but if you don't have bread flour in stock, you can use all-purpose flour. Tip: Make the whipped cream cheese right before serving so the cookies remain crunchy.